9 ball Trick Shots - Get Out Of Jail! As you see from the graphic above, the cue ball is trapped near the left hand corner pocket - it's in jail! Set up balls 1-8 to create the jail, place the cueball 'in jail' and position the 9 ball over the far corner pocket as shown above. 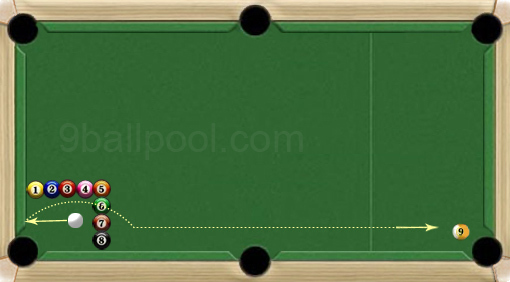 To help the cue ball 'get out of jail', you need to move it to around 4 inches from the left-hand cushion then play it towards the cushion with a medium strength shot using top english or spin so that it kicks off the cushion and jumps over the balls as shown above then runs down the table where as an added bonus it pockets the 9 ball.